I want to bring to your attention a new utility - Cost Calculator. This program allows you to find out the exact cost of a ship at a given level of technology. You can find out how the price will change with changing technologies and how much the ship will cost with minimum and maximum (all 26) technologies. The program is under development, therefore, not all the planned functions have been implemented yet. About errors, inaccuracies, report here or antey007(dog)list.ru. Proposals, corrections and other comments are welcome. If you are friends with Qt, I can send the source code. A new version is available. Now you can read designs directly from mX and hX files. 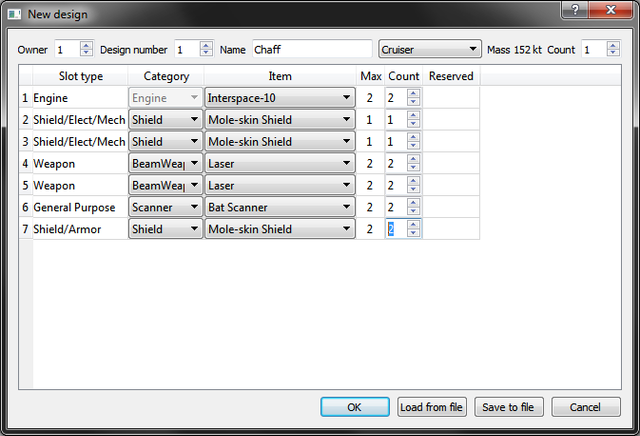 The interface of the cost calculator has changed from a design-oriented to a fleet-oriented. 80 kilobytes of source code turned into 18 megabytes of executable. This is QT! There should be laws against executables bigger than Stars! itself. The main window of the program. Initially, it is empty. You need to create a new design, read a previously saved design from a file, or import designs from Stars2! mX or hX files. Dialog of creating a new design. You do not have to hit the small "+" and "-" icons with the mouse, you can use the mouse scroll. 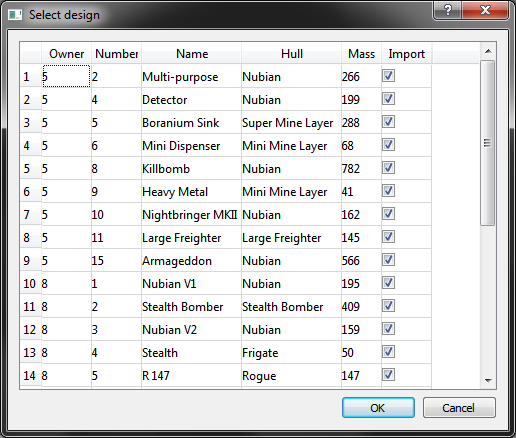 When importing from the mX or hX file, you can choose which designs to import. After importing any design can be opened with a double click and if desired, edited. You can save the design to a file. I can not insert the default file name, but I can put it on the clipboard. Try clicking on Ctrl + V after opening the file save dialog. Imported designs can be sorted. There are 5 types of sorting, each in ascending and descending order. 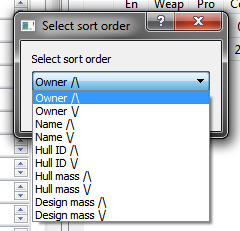 I accept the wishes for the introduction of other types of sorting. 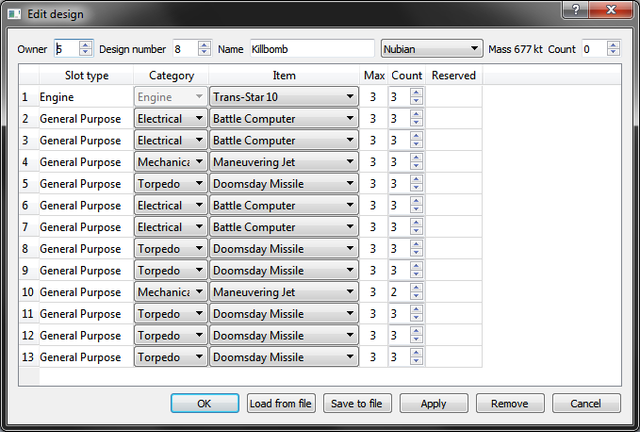 You can "assemble" your fleet to find out its total cost in resources and minerals. Again, you do not have to hit the small "+" and "-" icons with the mouse, you can use the mouse scroll. It is possible to find out how miniaturization affects the value of an individual ship or an entire fleet cost. Also you can count the amount of minerals in the salvage after the battle. 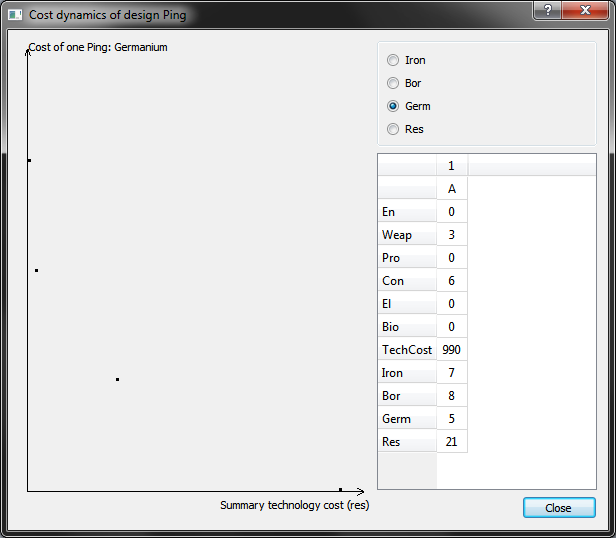 The CostDynamics button opens a window for a detailed analysis of the cost of one design, depending on the technology. 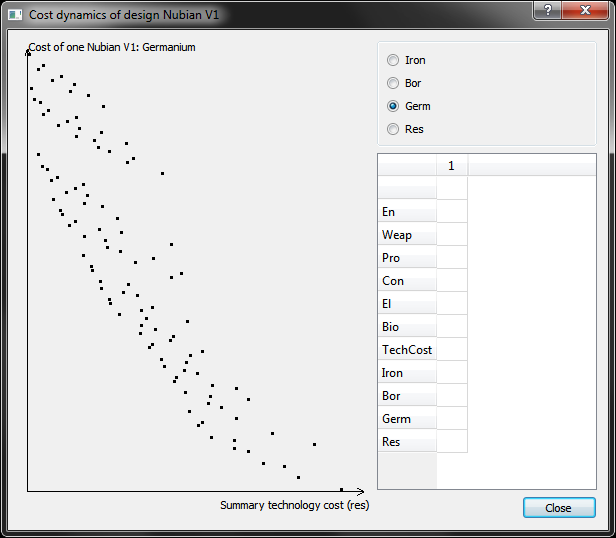 The first of the loaded designs that has a non-zero value in the "Count" column is analyzed. Some designs can be processed for a long time. I have some designs processed up to 2 minutes. This window shows the dependence of the cost of the ship (in any minerals or resources) from the total resources invested in research. You can click on any point and in the table on the right to see the technology and the price of the ship (point A). In addition, it will be shown (points B, C, etc.) 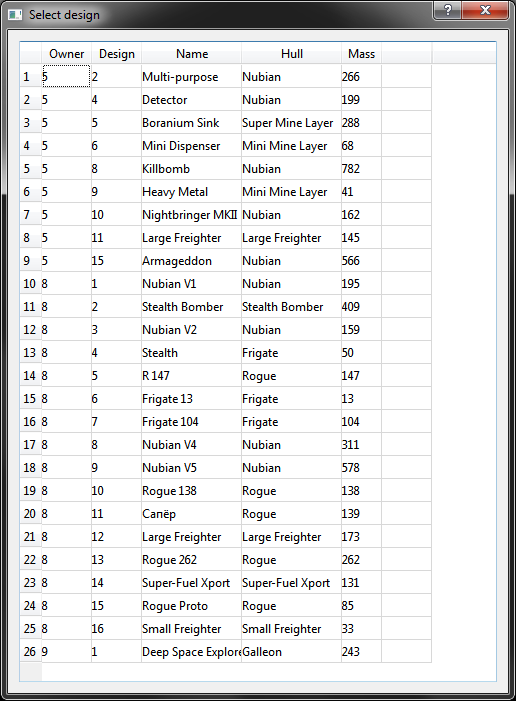 how the ship's cost will change with the next increases in research. For example, the picture below shows that with the En6 / W14 / P8 / C13 technology, the price of the Hood is 718/205/270 minerals and 605 resources (point A). You can investigate +2 levels of Prop, then the costs of Iron will drop to 714, and resources - to 597, bor and germ will not change (point B). As always, I'm waiting for suggestions on improving the program or introducing new features, fixing bugs and other comments and remarks. You can save the design to a file. Sweet! Does that include known enemy Designs? Will it be possible to later load a 'library' of saved Designs? Due to lack of time, the development is frozen. I hope I can continue this work later, in 1-2 months. Thanks for your work so far, Antey, very useful program.